One of my passions in life is photography. I have been taking photos of various subjects in the field since 2006, influenced and persuaded by my husband. Lately I have been concentrating on wildlife photography, specifically birds. Initially, bird photography was not really a pleasant experience and I found it very difficult. The equipment was extremely heavy and I wasn’t used to carrying such heavy loads! Eventually, the adventures in the field and the rewards of wild bird images led me to love bird photography. What I didn’t realize was that this hobby would also lead me to make amazing discoveries about the life of Dr. Dioscoro S. Rabor. There was a discussion in the Philippine Bird Photography Forum about a certain book titled Birds of the Philippines by Dr. Dioscoro S. Rabor. The name immediately got hold of my attention because I knew that I had a grandfather named Dr. Joe Rabor who was a scientist. After confirming with my father, it dawned on me with pride and a big smile that my affinity to wild birds had led me to discover that the Father of Philippine Conservation and Ornithology was my grandfather! Dr. Dioscoro Siarot Rabor was the younger brother of my grandmother Cristina Rabor Bas. My grandmother was a teacher back then. All of my grandmother’s siblings pursued and eventually became successful in their chosen field of expertise. Their excellent academic performance is no doubt reflective of the family’s stature in the academe at that time. 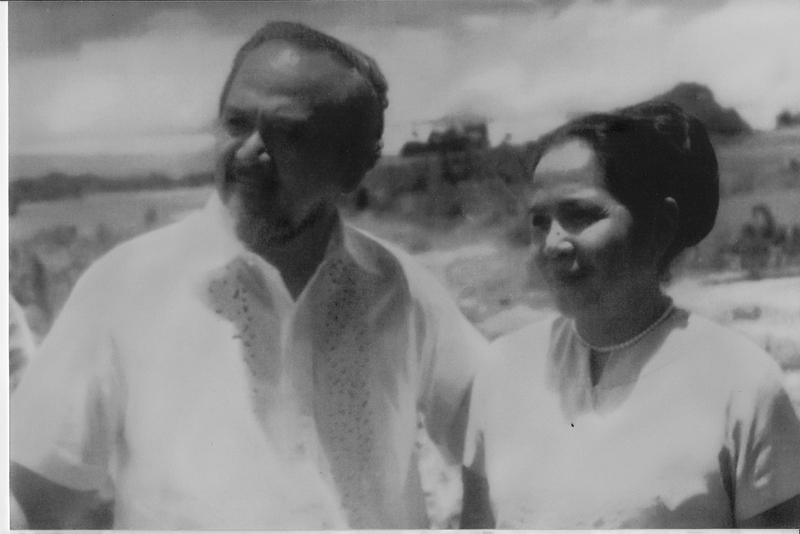 Dr. Rabor was married to Lina Florendo Rabor. She was not only his life partner but also a teacher and biologist. They were a tandem and worked side by side. She took care of the domestic chores in camp during their expeditions as well as at home. They had six children whose lives were shaped by their parents’ professions. All six children were born during his academic stint at the Siliman University. The elder son was named after Dr. Rabor’s father and father-in–law. The younger son was named after Dr. Rabor’s two good friends who were an ornithologist and herpetologist. The three daughters were named after birds and one was also named after a fish. All of Dr. Rabor’s daughters became Doctors of Medicine. This must have been a fulfillment of a dream, since both he and my grandmother were frustrated doctors (MD), mainly due to economic reasons in their younger years. My grandfather was a family man. Even with his very hectic schedule he made sure he spent time with his wife and children. Every weekend he brought the family to a weekend house up in Camp Lookout, Valencia, Negros Oriental. The kids and some of their friends would do a lot of bird watching as well as learning about the importance of human ecology. They really looked forward in spending time with their father. During summer vacations, the whole family would join him in his expeditions. The fifth child, my Auntie Ardee was only a year old when she experienced her first expedition with her father to Mindoro. The children enjoyed the idea of being out in the wilderness with their father and being exposed to the grandeur of nature. They were taught how to survive in the wild, sleeping in tents, carrying and taking responsibility for their own belongings. They learned a lot from their father as well as from other scientists who were part of the team. They learned how to skin birds for taxidermy purposes, identify the different species they came in contact with, the importance of putting bands on birds, and even how to band them. When it came to planning an expedition, my grandfather was very thorough in all aspects. Normally a letter of intent was sent a year before to the Governor or Mayor of the particular place or town stating the purpose of the expedition. This was to ensure that peace and order was observed during the safari. Safety and security was very important to the whole team. There would be about 30-40 crew in the exploration. There were scientists from different fields, hunters, trappers, porters, cooks, and miscellaneous help. Each one had their own role to carry out and responsibilities to accomplish. The Team could be distinguished by the uniform they wore during the exploration. Their base camp would always be situated near a water supply, as it’s a necessity for all. The members of the expedition team were expected to return to base camp to retire for the night. All the supplies from provisions, medical and scientific equipments, armaments and ammunition were all stowed in the base camp. At night the camp looked like a small town in the middle of the forest, as it was very bright and could be seen from afar. Because they studied birds and mammals from different altitudes, they also had sub-camps for the crew to stay in if they couldn’t make to the base camp for the night. In some of his expeditions he had naval teams to assist in the study on ectoparasites for the purpose of preventing the spread of disease and of course he headed the MAPS, Migratory Animal Pathological Survey. In one of his expeditions to Abra way back 1947, he almost lost his right leg in a serious vehicular accident. As they were driving along, my grandfather moved to the extension seat of an army truck to accommodate a pregnant woman who hitched a ride with them going up the mountain. Then, the army truck they were in skidded and almost fell into the ravine. The driver had no choice but to slam the truck against the mountainside. My grandfather’s right leg and foot were trapped against the truck. The injury was so severe that an American doctor in La Union advised him that they would have to amputate his leg. However, he insisted that he would rather live with an injured leg than a prosthetic one. All his expeditions were put on hold due to his injury. He was on crutches for some time. Eventually, he went back to giving lectures and doing research in Siliman University. However, a man like Dr. Rabor doesn’t give up easily. With his strong will, determination, and good physique he climbed Mt. Talinis in Negros Oriental. He was back doing what he truly loved — being out in the field with nature. These tales as narrated by my Auntie Dr. Ardea Rabor and Uncle Atty. Valfredo Rabor have inspired me. It’s as if I am retracing the family’s footprints through my own adventures in the field of birding and wild bird photography. I am sure there are more stories to tell and adventures to share — good reasons for our families to meet! Atty. 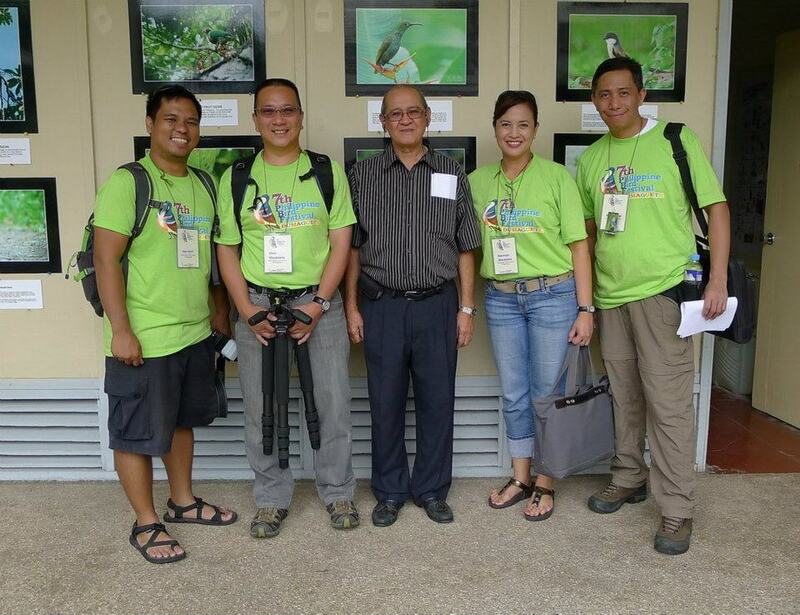 Valfredo Rabor at the 7th Philippine Bird Festival in Dumaguete. In the photo from L-R Jopsy Josef, Clemn Macasiano, Atty. Valfredo Rabor, Marester Bas Macasiano, Nilo Arribas. Photo by Christian Perez. nako pangg, didn’t know you maintained a blog pala 🙂 very interesting story and a rather pleasant discovery that you’re pursuing a passion that’s part of your family legacy! kalingaw jud! ikaw na! So honored to have known a family member(“,) Great Blog! Happy New Year! Happy New Year Lisa and the pleasure is mine……. Thanks Pangga for appreciating my work, im just a contributor on e-Bon. Its just amazing that thru my passion (wildlife photography) i got reconnected to my roots, my Family. Pride of the family and the nation… well done! it’s so nice to read heart-warming stories such as this. with me playing badminton and doing my daily walk/jog, who knows? i might discover somebody famous and be related to that person or may be i will be the one who will become famous. who knows again! Wonderful picture of Dr. Dioscoro Rabor and his wife. Brought back a lot of memories. I was one of Dr. Rabor’s student in 1978 at UPLB. I always remember him on May 18 if I remember correctly was his birthday. He had a head of the Philippine Eagle ( Pithecophaga jefferyi) on his table. One time he brought food and invited me to taste it. ( yummy like chicken but I knew it was something else) When I asked what it was he pointed the wild civet cat that was being worked on at the next room for taxidermy. I treasure all the memories I have spent having meriendas with him and his wife ( and other staff members) in his office at Forestry and having long walks to different peaks of Mt Makiling for our Ornithology class every Saturday. Hi Mona Liza…..your so lucky you’ve met my Lolo Dioscoro and Lola Lina and was able to join their expeditions. Great memories, definitely……..
Hi Mona Liza, what an amazing experience to study under Dr. Rabor! I would love to hear more of your stories, especially about your Ornithology class. Would you be interested in writing about what it was like to go birdwatching in the 70’s? Hi Ms. Marester! May I say thank you for having this blog, I am searching for the roots of the Rabor Ancestry. I keep digging for details about of our clan but it is always a dead end. But your blog has made way for me to know that indeed Rabor is based in southern part of Cebu. I am hoping that you happen to know a record of our ancestral tree.